Step up from your curry flavoured instant or pot noodle with this hearty coconut curry ramen noodle soup with crispy seared tofu, medley of vegetables, enoki mushrooms and chayote/daikon radish dumplings. This elaborate filling bowl comes ready in just about 40 minutes. The days of instant noodle, pot or packaged, are long gone at our place. To be honest, I was never much a fan of them. My mum always saw to it that we never indulged on these junk food — she would always remind us of how nasty and non-nutritious these noodles were. She was right. It was only later when I was a university student living on my own that I occasionally had recourse to the convenience of seasoned instant noodle soup — curry flavour used to be my go-to choice. Nowadays, these precooked dried noodle blocks with the unapologetic MSG-laden seasonings are practically nonexistent in my pantry. Not for the below par nutritional aspect though, but funny enough, I have no time for instant curry ramen! Most of my time is spent devising new recipes and improving my existing ones that convenience food, especially with a nutritional profile ranging from low to naught, find little room on the menu. Cooking as far as possible from a selection of wholesome ingredients, I selectively choose my “junk” convenience food to include a few that do pose reasonable nutritional value, except for the once-in-a-while odd occasion. That being said, it does not mean that we no longer eat noodles. We make our own ramen noodles. When we are short of time though, these organic sweet potato and buckwheat (soba) noodles or some rice noodles fit the bill. In fact, we like all the King Soba range of noodles. As for flavouring, a tablespoon of a good miso paste diluted in some hot water to make a tasty broth usually do the trick for a quick-fix. However, to rekindle my love for curry flavoured noodles, I recently came up with this coconut curry ramen that Kevin quickly became so fond of that he insisted on making the recipe demonstration. If curry and noodles have always been a combo you would grab from a pot noodle, then it’s time you try this homemade version. For this time, we brought a little variation to our homemade noodles recipe by swapping the all-purpose flour for whole spelt flour. It worked brilliant and the noodles came out with a subtle nutty sweet taste to them. They married the coconut curry broth to perfection. This has become our new current favourite. The crispy seared tofu adds a nice touch of texture. 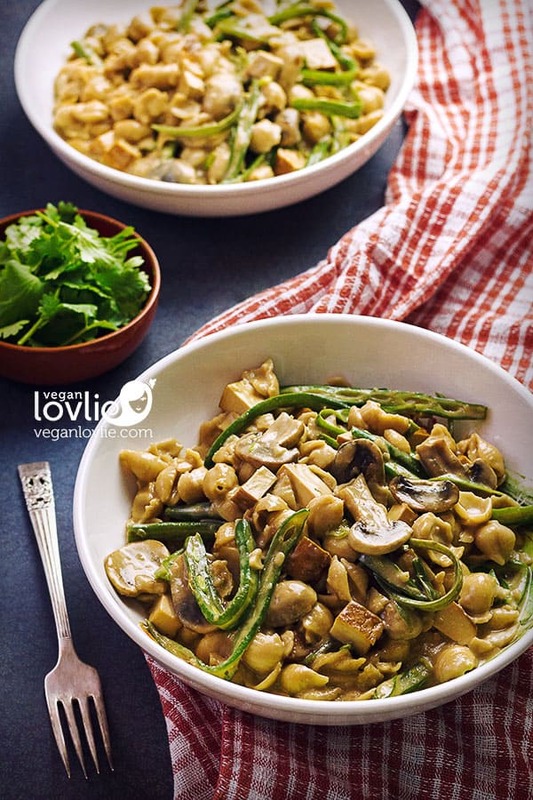 We recommend sauteing the veggies separately for more flavour and control on the optimum cooking time for each vegetable. 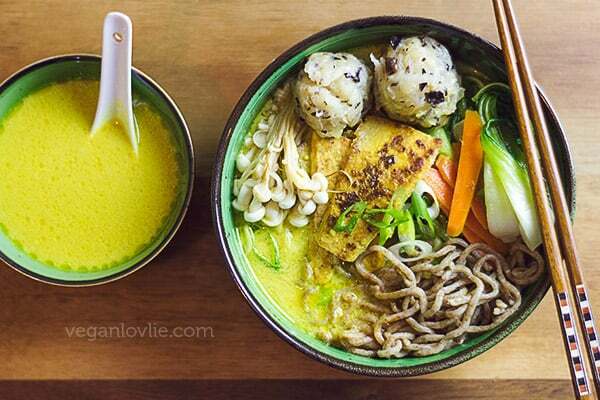 To add a little Mauritian flair to this curry ramen, we tossed in a couple of chayote or daikon radish dumplings. We often have a frozen batch of them that we take out and steam to pair with our noodle soups. These dumplings are a common Mauritian favourite with noodles in broth. Watch the recipe video as Kevin makes this delicious noodle soup. Start by making the coconut curry broth. In a saucepan on medium heat, add the chickpea flour. Roast for 3 – 4 minutes then add the curry powder and turmeric. Roast for one more minute then add the coconut milk, a little at a time while stirring constantly (a silicon whisk is helpful to avoid any lumps from forming). Once all coconut milk has been added, continue to simmer uncovered while stirring until broth starts to thicken (about 5 minutes). Add some water to adjust the consistency to your liking (about 1 1/2 cups). Set the broth aside. Place a large pot of water (for the noodles) on the stove and bring to a boil. If you are adding dumplings too, you may use a steamer pot instead and steam the dumplings. Once steamed, use the boiling water to cook the noodles. (You can also use a steamer rack in the regular pot, then remove the rack, change the water and then boil the noodles. It may be handy to keep some boiling water in the kettle for this, then add to the pot). Meanwhile saute the tofu and vegetables. In a skillet on medium-high heat, add one teaspoon coconut oil. 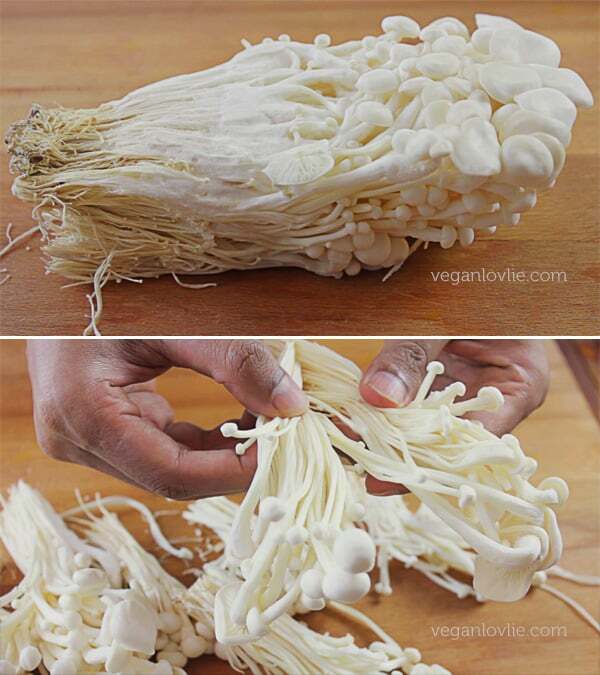 Once heated, add the bunches of enoki mushrooms. Cook for about one minute on one side then turn over and cook for another minute on the other side. Remove from the heat and set aside on a plate. Now saute the carrots in the same skillet. You may add a little oil if required. Cook while stirring occasionally for about 5 minutes then add in the bok choy. Cook for another 2 minutes or until bok choy is lightly wilted. Add a little salt to taste. Remove from the pan and set aside. In the same skillet still on medium-high heat, add one teaspoon coconut oil. Once heated, add in the tofu slices. Sear until golden and lightly crispy on one side, then turn them over. 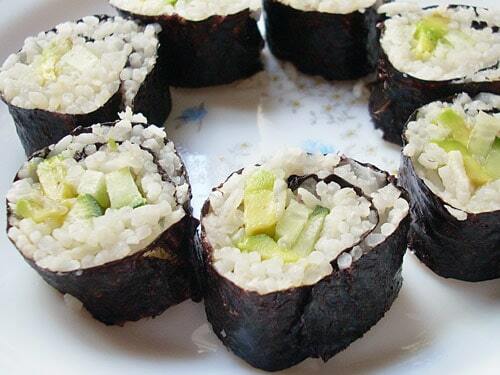 Add a few dashes of soy sauce (if using) or some salt. Cook until the other side is golden and lightly crispy. Remove from the skillet and set aside. By now the water in the pot should be boiling. 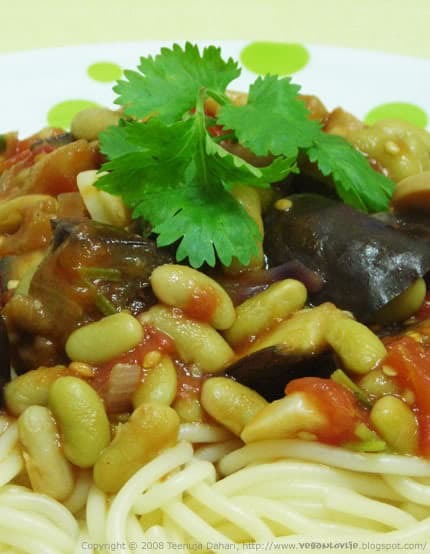 Drop in the noodles and cook for 2 – 3 minutes if using fresh homemade noodles or cook according to packet instructions. Remove from the water and place into serving bowls. 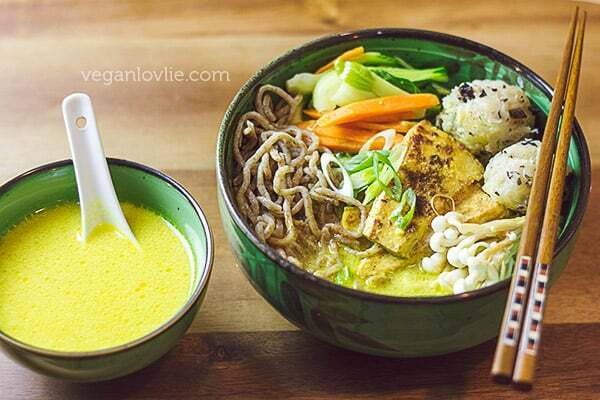 Arrange the vegetables, tofu and dumplings onto the noodles. Ladle the curry broth but do not overfill as this coconut curry broth is quite rich and filling. Garnish with some chopped scallions or spring onions. Serve immediately. 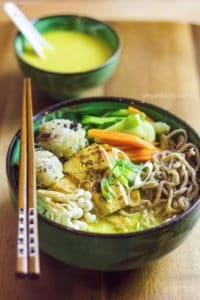 A hearty coconut curry ramen noodle soup with crispy seared tofu, medley of vegetables, enochi mushrooms and chayote/daikon radish dumplings. This elaborate bowl comes ready in just about 40 minutes. Start by making the coconut curry broth. In a saucepan on medium heat, add the chickpea flour. Roast for 3 - 4 minutes then add the curry powder and turmeric. Roast for one more minute then add the coconut milk, a little at a time while stirring constantly (a silicon whisk is helpful to avoid any lumps from forming). Once all coconut milk has been added, continue to simmer uncovered while stirring until broth starts to thicken (about 5 minutes). Add some water to adjust the consistency to your liking (about 1 1/2 cups). Set the broth aside. In a skillet on medium-high heat, add one teaspoon coconut oil. Once heated, add the enochi mushrooms in small bunches or clumps. Cook for about one minute on ones side then turn over and cook for another minute on the other side. Remove from the heat and set aside on a plate. By now the water in the pot should be boiling. Drop in the noodles and cook for 2 - 3 minutes if using fresh homemade noodles or cook according to packet instructions. Remove from the water and place into serving bowls. Pin this recipe and save it for later.